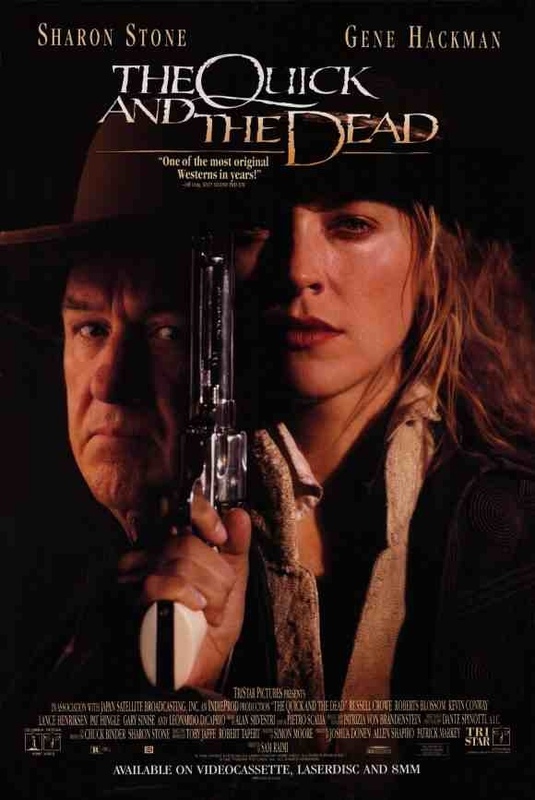 Starring: Sharon Stone, Gene Hackman, Russell Crowe, Leonardo DiCaprio, Lance Henriksen, Gary Sinise, Keith David, Kevin Conway, Fay Masterson, Tobin Bell, Pat Hingle, Roberts Blossom, Mark Boone Junior, Scott Spiegel, Mick Garris, Bruce Campbell, Woody Strode. There’s no doubting director Sam Raimi when it comes to his playful nature. He managed to inject hilarity into horror in “The Evil Dead” series and does so again with the western. Not taking his material too seriously at all, here he delivers a cartoon take on the duelling western gunslingers. The town of ‘Redemption’ holds an annual gunslinging contest (a strict local custom in which pistol-packers young and old, local and not, shoot to the death). Riding silently, moodily and mysteriously into town is, Ellen (Sharon Stone). A woman who keeps her motivation quiet, working her way into the contest with a score to settle against the town owner Herod (Gene Hackman). Although this borrows heavily from the great Sergio Leone/Clint Eastwood cowsers, it’s playful use of the camera and refusal to take itself seriously gives it a fresh feel all it’s own. Raimi’s use of camera angles and slow motion shots are sublime and what really make the film. The camera is just as much a character as the eccentric bunch on screen. The focus being on the nervous eye-contact and elaborate ticking of clocks, in keeping with true spaghetti western style. 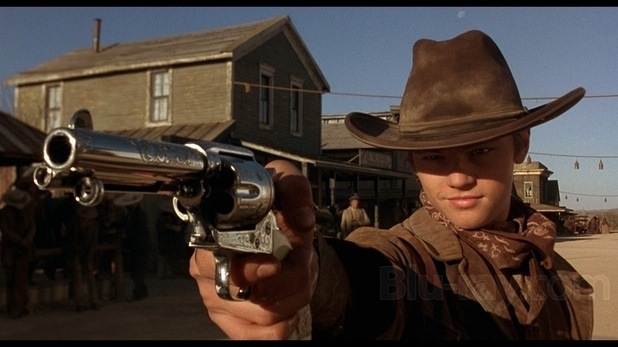 It’s a very stylish parody on the western showdown scenario helped by a who’s who cast of ecclectic character actors, not to mention a young Leonardo DiCaprio and Russell Crowe at the beginning of their careers. It’s completely ludicrous but it’s ludicrous nature and style is exactly what makes it fun. This entry was posted on January 29, 2012 at 7:06 pm and is filed under Action, Western with tags 1995. You can follow any responses to this entry through the RSS 2.0 feed. You can leave a response, or trackback from your own site.